the best care for your whole family! Dr. Travis Roberts loves what he does and it shows. He strives to have the best technology for his patients and his office stays up to date with the latest in dental materials and equipment. 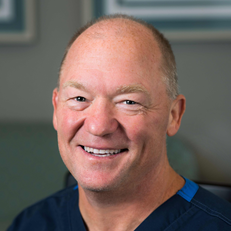 Since graduating from the University of Missouri-Kansas City School of Dentistry in 1994, he has been an active member of the American Dental Association as well as the Kansas Dental Association. Our team is filled with fun & friendly individuals that love to provide a welcoming environment for our patients. We value your time and pride ourselves for always being on time! Welcome to Adams Dental Group, we look forward to meeting you. Welcome to Adams Dental Group, your family dentist in Kansas City, better known as the dentist in the little blue house. We have been in this same location in Kansas City, Kansas for decades and that’s how our patients refer to our office. It all started when Dr. John Adams opened a dental practice in this house back in 1975. Dr. Roberts took over the practice in 1994. Because Dr. Adams was so well-known, loved and respected, Dr. Roberts decided to keep the name of the practice the same. To this day, Adams Dental continues to be the family-oriented, friendly, dental practice it has always been. Thousands of Kansas Citians have been receiving wonderful dental care for decades by choosing us as their family dentist in Kansas City and passing the word on to their family, friends, and neighbors. "I have been a loyal patient of Adams Dental Group for over 15 years. Dr. Travis A. Roberts has been my dedicated dentist and Kelly as my dental hygienist. The exceptional care, quality, and compassion they give to their patients are just a few of the reasons I keep coming back. Not only do they know you by name, the staff are professional, friendly, and make you feel comfortable when in their care." "I have been a patient of Dr. Roberts since 2003! His professionalism, knowledge and efficiency are top notch. The staff is extremely friendly, little to no wait time and I always leave with a bright smile thanks to my awesome hygienist, Kelly! I highly recommend this dental office to people of all ages!!" "I just wanted to drop a note and let you know how much we appreciate everything you do for our entire family and friends. Before knowing you I use to dread dental appointments. You and your professional staff make me feel at ease. I also value your technology when I need an occasional crown. The one-trip visit for a new crown is wonderful. In years past, I would feel naked with a temporary waiting for a permanent."